Children and suicide is a fact more so now than ever before. As a grief counsellor, I have parents come for counselling; more often it is the moms. A child can be any age, but for this article I am referring to younger, school aged children. The questions are numerous and I do not have all of the answers. At this time I am sharing concerns, asking YOU the adult to pay close attention to the children; their life may depend upon it. Children may have thoughts of suicide and die by suicide for a variety of reasons. The experienced pain and suffering after a loss in their life such as the death of a parent, sibling, grandparent, friend or other special person whom they are closely connected to. Do not omit the effects of the loss or death of a pet. 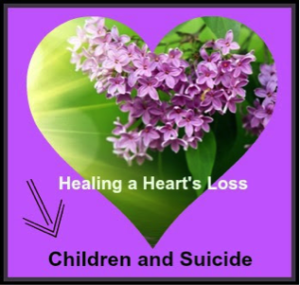 Death losses are not the only forms of loss children experience. Consider divorce, separation, relocating from extended family, moving to a different school away from friends, prolonged illness, and more. Other concerns children may have include being bullied, being perceived as “different” than their peers, having a mental illness such as struggling with depression or anxiety. Identifying as gay, bi-sexual, transgendered, being abused and more can be added to the potential reasons children die by suicide. The point is, children feel, have fears and concerns, perhaps not exactly the same as adults, but as real for them as it is for an adult. I have heard children and young adults say they are suicidal and add, that it comes down to the fact they are not accepted for who they are, by someone they care about. Children, often want to be praised, not demeaned for what they say, feel, do or think. As an adult you may not notice the signs a child is having suicidal thoughts. In many cases the child hides their true feelings from adults. The odd time you might hear comments such as, “I don’t want to live anymore”, “What’s the use…no one cares about me”. I know you may have heard these comments and not paid much attention to them, because they have said often, but children are dying by suicide, even those in grade school. Children are struggling being in society and trying to live up to expectations in a confusing world. As adults, parents, teachers, counsellors, the general public and more; we can put our head in the sand and hope “suicide” goes away or we can be proactive. Pay attention to what you say and do. Try to make amends when able to do so if need be. Be open to the differences in each other, even when you do not understand. Having said this, I know there are times when you try to do everything to protect a child and it is not enough.